Our minds are lined with shelves overflowing with advice that we’ve accumulated over the years. Mental libraries, divided by subjects such as love, life, and happiness. Many of the tomes covering these various subjects are made up of simple but memorable sayings to help us along our path. When I paint a picture in my head of what this expression means to me, I picture a person opening a birdcage and letting a yellow canary fly out of a narrow apartment window, or a little boy letting his excited terrier off of the leash in a park. Eventually, both owners have their pets return dutifully back to them. I think this expression serves as a powerful microcosm of the dependent relationship dynamics which characterize many modern romances. The problem with this expression, and the picture it paints, is it associates the notion of love with both ownership and reliance. I think both the notions of ownership and reliance are contrary to that of love, yet they’ve found a place in many of our intimate relationships. The one you love is not a car. You didn’t buy him from a salesman. She does not come with ownership papers. In order to set something free you must first be the owner of it (or at least have it in your possession). You had to of restricted his or her freedom in the first place. It seems tragically contradictory to fall in love with something when it is wild and free – whether its a bird soaring in the sky or the beautiful stranger you met on the train – only to try and capture and cage it. We have allowed the complex toxins of private ownership to leak into the simple, pure, and unrestricted stream of love. Loving someone isn’t releasing them. Loving someone is never wanting to cage them in the first place. Reliance, in my opinion, is a much more subtle and dangerous form of ownership. The canary doesn’t return to its cage out of love, it returns because its the only source of nourishment and drink that it has ever known. The canary has grown to love its chains. It no longer believes in itself. 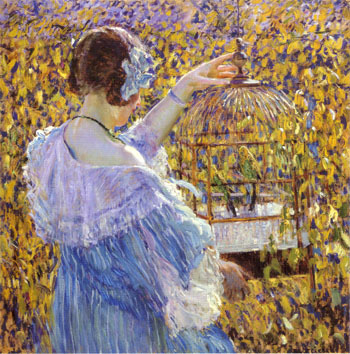 The canary is in a state of dependency and has learned to fear a life without the cage. It fears being apart from the owner it depends on for safety, warmth, food, and water. The decision to return to the owner is both self serving, and convenient. The relationship has, from the outset, fostered a sense of real necessity. We pile up these imagined conclusions as though our world didn’t exist before this person came into our lives. We begin to perceive life with this person as essential to maintaining the things we value in our world. These things range from the relatively narrow in scope, such as a specific circle of friends, a shared living arrangement, custody of the children, or the new puppy, to those broader in scope, such as our ability to be happy, accepted, appreciated, or loved. We become the canary. Our reliance becomes our cage. I think it’s important to note that not all reliance is bad. Being committed doesn’t mean being caged. Too many people confuse commitment with a lack of freedom. Being in a relationship doesn’t mean being reliant on someone else. I really do hope the people in my life that I love the most know they can rely on me. I hope they know they can come to me for any type of help – for advice (although I can’t promise it will be very good advice), when they are feeling blue, need a shoulder to cry on, a wing man for the night, a hug, the shirt off of my back, or all of the above. I want my significant other to rely on me. I want her to be certain she can rely on me for unconditional love, acceptance, and support for the rest of her days. But there is a major difference between being in a relationship where you can rely on one another, and one where one (or both) of you feel like you must rely on your significant other. In the former situation, a couple is adding additional wind under each others’ wings. In the latter scenario, one or both partners are chained to the other by shackles cast in iron reliance. The greatest thing in the world is to know how to belong to oneself.” – Michel de Montaigne, The Complete Essays. We must be the canary without the cage. Be responsible for your own happiness, acceptance, self-belief, growth, success, and well-being, because no one else can ever give you those things. Don’t create your own prison by accepting the delusion that someone can. And, as much as you may want to, you can’t provide any of those things for another person, either. So don’t be the one caging another canary with promises to provide them with those things. Instead, accept that you are responsible for your own life, and others have the same obligation to themselves as you do. The sooner you do that, the sooner you’ll find another canary just as wild, free, and as perfect as you are. There is nothing more powerful than a love that is born out of love. I can’t think of anything more pure or beautiful than two souls soaring together for no reason other than the mutual respect and endless love they share for one another. That is a flight that will last an eternity.